How do I order a freeze drying service for an arrangement? Use the contact us page to let us know about your needs. We will be able to give you an estimate. After that, a $100 deposit is required to order. We will help arrange pick up or shipping of your flowers and then begin the freeze drying process! How can I ship my flowers? Bouquet by Times to Remember. Tape coolant or bottles to the bottom of the box. Add a layer of packing material. Place flowers into the box. Fill the box with packing material to secure the flowers. Write FRAGILE and indicate THIS SIDE UP on outside of box. You will need to overnight the flowers. The US Post Office, Fed Ex, or UPS are able to provide these services for you as long as they guarantee next day delivery. Once the flowers arrive we will call you to confirm that we have received them. It's best to ship as late in the day as possible and not on a weekend. 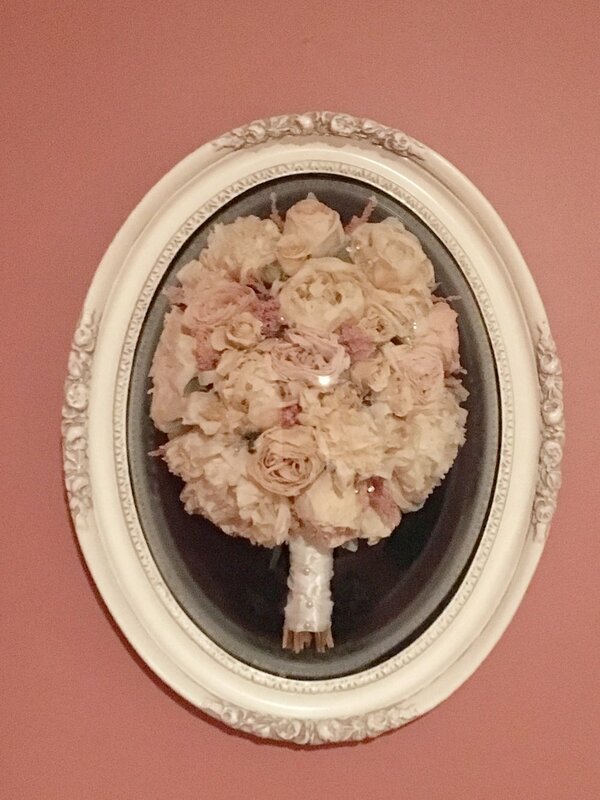 Same bouquet as above - preserved as artwork. Where do I ship my flowers? How do I pick a frame? Follow this link to Custom Display Designs to view frame options. The size of the frame or container that you'll need depends on the size of the arrangement and memorabilia you are including. We can help you to pick the best frame and background for your flowers and design aesthetic. How can I pay a custom balance? For custom orders, you can pay the remaining balance due on paypal by sending it to my email address: kwaldronacn@hotmail.com.